£200 bursary and three free coaching sessions for existing community cinemas! Have you been screening films for two years or more? Want to explore some new ideas for your community cinema? Want further training in a particular area? Apply for Sustain Fresh Start! 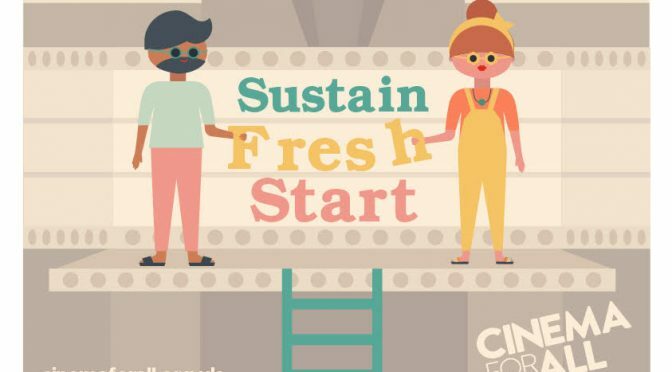 We are offering a limited number of places for existing community cinema groups on our BFI funded Sustain Fresh Start Programme. This opportunity is designed to help you identify and improve on areas of your operation and help you achieve your ideas and includes; three 90 minute Skype coaching sessions with our expert Cinema For All team on marketing and publicity, fundraising and outreach, immersive cinema, audience development, technical advice and more! Participants also get a £200 bursary which may be used towards filling a gap in your skillset identified through your coaching sessions. Perhaps you’d like to have a logo or website designed or get extra training?